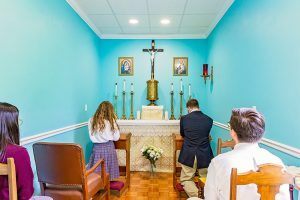 At the core of the mission of St. Bernard Preparatory School is the desire to instill “a love of learning and a life of virtue,” in a life dedicated to Christ. In light of this basic apostleship, the spiritual life of the school is inspired by the Benedictine ideal of a community life of work and prayer (“orare et laborare”). As Saint Benedict sought in his Rule for monks, so too does the school community seek a life of spiritual growth, centered in intellectual development and balanced with physical and social activities, recreation, and rest. To this end, oriented by the Catholic tradition, the school offers comprehensive and structured academic, athletics, and faith life programs. The Faith life programs seek to integrate all of these dimensions of school life into the “work of God,” centering the school life in personal and communal prayer and service. This includes school wide Mass and prayer services, retreats, pilgrimages, volunteer opportunities, community service, and a variety of additional programs and events. Students have the opportunity to attend the March for Life each year in Washington DC. For more information on the faith based opportunities available to the student at St. Bernard please contact the school chaplain, Fr. Bede Marcy, frbede@stbernardprep.com.